What Should the Next Android Be Called? Ice Cream Sandwich here! Ice Cream Sandwich is here! And in the world of Android, that can only mean one thing (besides a bunch of nerds whining about not having their update yet): Oh god I need to know what's next. As it turns out, Gizmodo has a pretty great record of predicting new Android names and features. At least, that's what my editor (who, uh, wrote the predictions) strongly suggested I write. 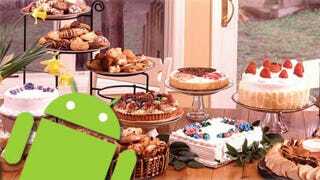 We've heard the name might already be settled, but for now, we're interested in what you think will be coming down the pipe in the next iteration of Android, and more importantly, what alphabeticalized dessert it'll be named after.